The Tour de Bintan started its ninth edition last Friday with a few big changes but one thing that remained the same was a weekend of exciting racing that threw up a plethora of memorable storylines. Many of those tales will no doubt be centred on the weather, with two days of nasty tropical storms doing their best to ruin one of Asia’s premier three-day festivals of amateur cycling, but the epic exploits of the Tour de Bintan’s class of 2019, such as the comeback triumphs of Nol van Loon (Specialized Roval Mavericks) and Yann Kai Oh (Project 852), will also live large in the tour’s history books. After eight years (plus the test event in 2009) headquartered at the Nirwana Garden Resort, the Tour de Bintan moved its HQ to the Bintan Lagoon Resort this year. The switch brought benefits such as a direct ferry service to the resort from Singapore, a bigger accommodation capacity that allowed more racers to stay on site, nine food & beverage outlets to keep them sated, and a course revamp for the concluding Stage 3 on the Sunday morning that, tough as it was, was a resounding success with the competitors. Another big change for this year was the introduction of bonus seconds of 10, 6 and 4 at two sprint points in each of the two open road races. This had a considerable impact on the tactics and some of the general classification standings. More than 1,100 men and women signed up for the 2019 Tour de Bintan, a record high. While the race has never failed to attract big numbers, the move to being a qualifying event for UCI Gran Fondo World Championship in 2017 has definitely raised interest in the tour. Since then, any riders who finish in the top 25 percent of their age group in the Stage 1 Individual Time Trial and/or the Stage 2 Gran Fondo Classic earn the rights to take part in the world champs. This year the big dance takes place in Poznan, Poland from August 29 to September 1. Of that new high of 1,100 participants, some 47 percent were newcomers to the Tour de Bintan, and for 12 percent of them, it was their first ever cycling event. Most of the complete rookies rode in one or both of the tour’s two less-competitive offerings, the Gran Fondo Challenge and the Gran Fondo Discovery. These are shorter versions of the main tour’s Stage 2 and Stage 3, and account for around a quarter of the total participants. The tour opened with its traditional race Friday afternoon against the clock from the Plaza Lagoi. The bragging rights for ITT glory are quite important for the top riders as Stage 1 is the only stage of the Tour de Bintan where all the riders in the race can have a direct comparison. It’s not all about the elite riders, though, as with those spots for the Gran Fondo World ITT Championships up for grabs, everybody goes in thinking they have a chance. The course was over the same deceptively tough 16.6km layout that has been used since 2017. With the start and finish exposed to coastal winds and a lumpy middle section, the course never allows the riders to get into a real rhythm, and so gauging how to calibrate the effort is more difficult than on a flat “power meter” type course. There are a few men, though, who have proved over the years they know exactly how to handle the Tour de Bintan TT course, and two of them, Pierre-Alain Scherwey (Allied World Treknology3) and Taylor Price (Roval Racing) did it again last Friday. Racing in the 35-39 age group for the first time, Price’s time of 23 minutes and 26 seconds looked like it was going to be the best, but the Roval Racing man’s spell in the virtual hot chair didn’t last too long, as Scherwey from the 40-44 division came through one second faster. While those two used a mixture of experience and power to win their age groups, the third-fastest man Thomas Thrall (Matador Racing) proved that a complete rookie could also do well, as the 19-34 winner was only four seconds slower than Scherwey. The other men’s ITT winners were Michael Anthes (Roval Racing) in the 45-49s, Liam Kelly (Specialized Roval Mavericks) in the 50-54s, Nick Adamus (Project 852) in the 55-59s, Matt Sheridan (4T2) in the 60-64s, Eddie McClean (Geylang Cycling Team) in the 65-69s and Russell Bell in the 70+ division. Incidentally, that last age group had five entrants, a landmark occasion as it was the first time 70+ cyclists had sufficient numbers to merit their own category. On the women’s side of the action, the ITT queen was Lucy Richardson. The Thailand-based Brit recorded a time of 27:35, which was nine seconds quicker than the next fastest girl, Annemiek Stegehuis (Paco Tora Concap). Third best overall and a further 12 seconds back was Yann Kai Oh (Project 852). Of note was that all three were racing in the 35-39 age group. The other women’s winners were Lenka Vackova (Rapha) in the 19-34s, Vicki Goodwin (Anza Cycling) in the 40-44s, Jeynelle Lee (Integrated Riding Racing Team) in the 45-49s, Mary-Anne Ellington in the 50-54s and Alison Dyson (4T2) in the 55-59s. Stage 2 acted as a qualifier for the UCI Gran Fondo World Championships Road Race, and as such the riders were split into six pelotons for the 140km Gran Fondo Classic: Men’s 19-34; Men’s 35-39; Men’s 40-44; Men’s 45-49; a combined Men’s 50-54, 55-59, 60-64, 65-69 and 70+; and a single Women’s bunch containing all age groups. The Women’s riders were due to roll off first from the Simpang Lagoi township at 7:30, but the weather gods had other ideas. Bintan and the wider region around the Indonesian island had hardly seen any rain for two months, so the breaking of the dry spell on Saturday morning could hardly have been worse timed. And it broke with a vengeance in the shape of a storm that instantly turned the tarmacked staging area into what looked like a shallow lake and played havoc with the temporary structures and facilities that been erected in the race village. The riders huddled and shivered in their team tents as they waited for the rain to stop. It didn’t, but it at least lessened enough for the race to begin some one hour late. Despite the downpour, the roads of the famously challenging course around the eastern portion of Bintan were remarkably flood-free, which wouldn’t have been the case under similar circumstances in earlier editions of the Tour de Bintan, a testament to how well the local authorities have improved the island’s infrastructure over the years. But the roads were treacherous for another reason, as the extended dry spell had left a residue of oil stained into the tarmac, and this began to ooze out randomly onto the surface under pressure from the heavy rain. The result was a spate of crashes across all the pelotons. It’s never good to see riders hitting the ground, but spills are regrettably part and parcel of bike racing. Roadies are a hardy lot, so with a show-must-go-on attitude, the racing was still of the top-drawer quality and intensity this prestigious event always draws out, despite the trying conditions. The Men’s 19-34 category produced some of the best racing. Thrall in the yellow jersey only had a small team to help him defend it, while the Specialized Roval Mavericks had a big squad at the service of their leader Van Loon, who had produced a disappointing time trial that left him a minute down on the GC. Constant attacks had eventually resulted in a small breakaway containing two Mavericks to escape up the road, as the Matadors couldn’t chase everything. This allowed Van Loon to sit in for the first free hours and then with some 15km to go, he surged out of the peloton, bridged to the break, rode straight through them and soloed on for a remarkable victory and an unlikely snatching of the yellow jersey. The 35-39 category also saw the lead change as a five-man breakaway containing Kris Guns (Project 852), Anand Chandran (4T2), Alan Blakie (Integrated Riding Racing Team), David Cheam (Matador Racing) and Motoki Nishimura (Mivro) left Price and the rest behind and had put almost four minutes into the yellow jersey by the time they crossed the finish line back at Simpang Lagoi. The fastest time trailer from that quintet was Guns and so the Belgian was now in yellow. Scherwey retained his yellow jersey in the 40-44 cat, as he and his team handled everything the peloton threw at him. With a big lead from the TT, he was happy to allow a bunch sprint, which was won by Chris Reynolds (Specialized Roval Mavericks). There was no change of lead in the 45-49 division, indeed the yellow of Anthes stamped his authority on the proceedings by riding away from the peloton late in the race and adding to his advantage by some 100 seconds. The 50-54 group also had a repeat winner as ITT champ Kelly broke clear with his nearest rival Chris Glasby (GB Coaching) after just 30km of the 140km and stayed away. A breakaway winner also triumphed in the 55-59 cat, Peter Williamson (Anza Cycling), but Adamus retained the yellow jersey with his third place on the day. Trevor Hyde (Sutherland Shire Cycling Club) took the 60-64 win, but Sheridan held onto the race lead. The 65-69s saw McLean finish first and extend his GC lead, while Bell did the same in the 70+ cat. Among the ladies, the biggest kudos went to the 35-39 age group pair of Stegehuis and Oh as those two finished four minutes ahead of the rest of the 60 women riders, with Stegehuis taking the line honours in the sprint and taking over the yellow jersey. Other women stage winners were Chelsie Tan (BikeLabz Racing) in the 19-34 cat, Jenny Neuse in the 40-44 age group, Lee in the 45-49 category, Lillian Rasmussen in the 50-54 group and Dyson in the 55-59s. Of those stage winners, Lee and Dyson retained their yellow jerseys, while Tan and Rasmussen assumed the overall lead in their categories. Goodwin kept her yellow jersey in the 40-44 cat after finishing third on the day. With the UCI Gran Fondo World Championship qualifiers over, Stage 3 was mainly about which riders would emerge on top of the tour’s general classification standings, but riders who were out of the GC picture still had stage glory to chase too. Ahead was a 108km course through the northwestern sector of the island, which had a few minor but also two major changes to the layout the riders had encountered in recent years. The first of the biggies was the addition of the Ria Bintan loop with 10km to go. This hilly 7km section was also featured in the ITT, but tackling it in a road race having already ridden nearly 100km would make a different beast. 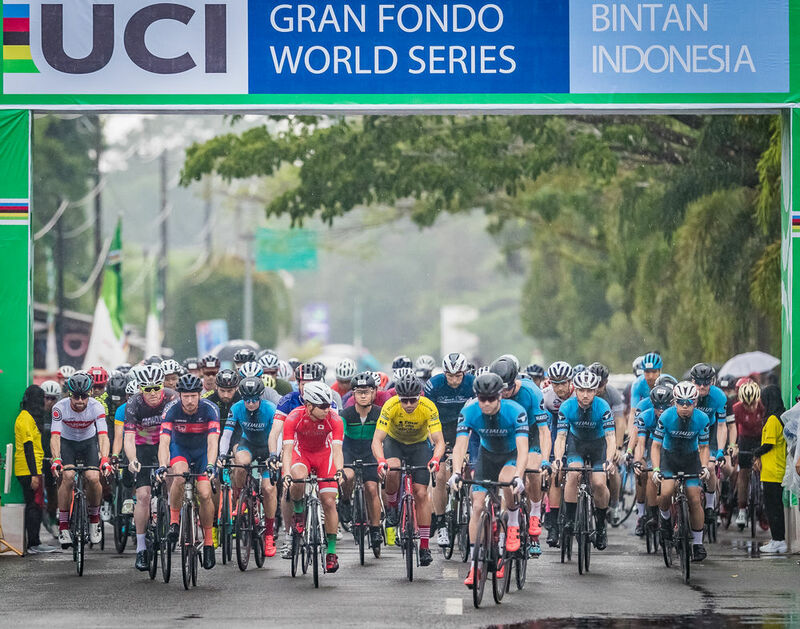 The other significant change was the 2.5km finale to Bintan Lagoon Resort, which featured a set of short but testing climbs and looked to be more difficult than the old finish at Nirwana Gardens. But not only did the racers have to contend with a tougher course, for the second day in a row Bintan threw a big storm into the mix. This time it didn’t affect the stage start, with proceedings getting under way in dry conditions right outside the Bintan Lagoon Resort lobby, but those that had dared to look at the weather radar beforehand knew that trouble was brewing ahead. The storm that hit after the riders cleared the Checkpoint Charlie rolling hills was so intense at one point that the riders in the men’s 40-44 and 45-49 categories decided to suspend the racing in their groups as bolts of lightning were landing too close to the road for comfort. Other groups soldiered on, and the result was riders strung out all over the course. The rain eventually eased up, though, and the fireworks again came from the riders on the road rather than from the sky. The men’s 19-34 race was again marked by an early breakaway as race leader Van Loon sent teammates up the road to eat up the bonus sprint seconds; with just a five-second lead on Dealton Prayogo (KGB), the Dutchman didn’t want to take any chances. With that task accomplished the escapees were reabsorbed and the attacks against the yellow commenced in earnest. Nothing stuck, though, and it came down to a reduced bunch sprint, which was won by Adulwit Phosangda (Aero Up X Royal Thai Police Cycling). Prayogo was second, but with Van Loon right on the Indonesia’s wheel in third, the man from the Mavericks had clinched the GC title. There was no such joy for 35-39 leader Guns, as a broken crank set forced the Belgian to abandon. Cycling can be cruel. A group of about 10 riders came to the finale together, and it was Bastian Dohling (Specialized Roval Mavericks) who prevailed in the sprint to take the stage. The major beneficiary of Guns’ misfortune was Cheam, with the Malaysian donning the final yellow jersey as overall category winner after three days of strong riding. The men’s 40-44 bunch surprised what remained of the combined 50+ peloton when they came powering alongside some 50km into the race. The latter group hadn’t stopped for a rain delay and hadn’t noticed the two earlier categories taking cover. After a bit of confusion, the older riders let the 40-44s go ahead to race by themselves. The usual scenario of attack, chase, repeat had the result that the group was down to less than 20 riders for the finale, but Scherwey had ridden comfortably all morning and was there for the sprint. He didn’t win Stage 3, that honour went to Edward Cork (Chain’s Sprockets), but the big Swiss had clinched another Tour de Bintan GC title, his third. Such was the attrition rate in the frantic racing that marked the 45-49 category, only 10 men were left in the front bunch to contest the final 15km, with runaway GC leader Anthes among them. An interesting twist arose when they absorbed a dozen or so riders that were the chase group of the 50+ peloton, but luckily that coming together didn’t have any significant affect as the bigger group tore through the Ria Bintan loop. There was a scare when some of the riders took the final left-hander into Bintan Lagoon too wide, with a few men going down, but Anthes was safe. The Shanghai-based German tried to take the sprint and the hat-trick of stage wins, but he had to be content with third behind his Roval Racing teammate Regis Robert and Rick Dumpleton (Specialized Roval Mavericks), and of course the GC title. A hat-trick of stage wins was achieved in the 50-54 division, as Kelly got away from the combined 50+ bunch in four-man break at the 70km mark with Peter Bennett (Allied World Treknology3), Glasby and Trent Illife (Specialized Roval Mavericks). This quartet actually caught the 40-44 bunch they had let go ahead earlier, and Kelly rode away from them all in the Bintan Lagoon finish to out a stamp on a dominating performance. Richard Paine took the win in the 55-59 cat and this moved him into second place on the GC, but with Adamus right behind him at the line, the Swiss rider clinched the GC triumph. It was a sweet success for Adamus as he lost the yellow jersey on Stage 3 in 2017. Hyde took his second successive stage win in the 60-64 age group, but the yellow jersey of Sheridan finished just two seconds back and so the big American defended the lead and won the overall title. McLean was another rider to go through the tour undefeated as he took his third stage win and the GC in the 65-69 cat. In the 70+ division, Bell couldn’t quite do the hat-trick, with Thailand’s Lersak Inchai taking the Stage 3 win, but the Briton Bell had a big lead going into the Stage 3 and he walked away with the overall title. From the women’s combined field, Stage 3 saw an early break from Tan, but the previous day’s dominating pair of Stegehuis and Oh eventually caught the Singaporean and they raced the last 60km as a trio. It was Oh who took the line honours from the three to take the 35-39 stage win and there was further glory for the Hong Kong-based rider; thanks to claiming 16 bonus seconds from the two Stage 3 sprint primes to Stegehuis’ 10 seconds, she overtook the Dutch women to clinch the GC title by just two seconds. Tan’s big effort gave her a second consecutive win in the 19-34 category and the overall triumph. The chase group of women riders containing the quartet of Dyson, Lee, Richardson and Louise Shaw, finished just over a minute back, with Dyson first over the line to take the 55-59 cat stage win and GC title. Shaw outsprinted Lee to claim her first triumph of the tour in the 45-49 division, but Lee clinched the overall victory comfortably. In the other women’s categories, Sek Ling Chew (Dawn Riders) won stage honours in the 40-44 age group, but Goodwin took the GC title, while Rasmussen triumphed in the 50-54 division for the second day in a row, and thus retained her yellow jersey. The 2019 Tour de Bintan concluded with a gala lunch and presentation ceremony on the beachfront at Bintan Lagoon under glorious blue skies. The riders and supporters who had gathered in Bintan from all over the world could now bask in their achievement of completing such a challenging event, and the friendly vibe that had hung over the three days of racing now turned positively festive. And mingled in with the competitors were many of the race marshals, commissaries, mechanics and volunteers that helped make the race such a success. Kudos too to the Bintan authorities and the local police. With the Stage 3 and GC presentations done, many of the racers were heading home with golden tickets to the UCI Gran Fondo World Championships, but before they left, there was time for two more awards, those for the best overall women’s and men’s teams. Integrated Riding Racing Team took that honour among the women, and for the third year in a row, the men’s collective gong went to the Specialized Roval Mavericks. The Tour de Bintan will return for its 10th anniversary edition next year, and if the race organisers at MetaSport’s track record of constant improvements is anything to go by, the landmark 2020 race will be bigger, better and even more memorable than the one that has just finished.